Conceived, developed and launched at Music Hackday Montreal 2011. Renoise is a sophisticated music sequencer and audio processing application with a mod tracker interface. One of the new trends in our community is the concept of a meta-interface. In essence, users use the Lua API to transform Renoise into something else, hide the Renoise window, and work with hardware interfaces connected to their own scripts. Grid Pie is “yet another meta interface”. It turns Renoise into a live performance audio recombination machine. Notifier Feedback Loop Detected. Help! I'm Screwed. I’ve been working with a similar concept for basic clip-like functionality. Could probably even be combined with this approach! So, do you imagine that the Grid is organized into 4 vertical columns, with each column representing a choice among 4 options? I was thinking this could be an option. What I envision is having up to 16 tracks playing at once (4 x 4). The copy/delete mechanism would use FIFO; move the track in the first available slot. What remains nebulous is if I should copy the DSP chains too, dunno if this would work, this is where your quoted idea makes more sense. It turns out I don’t have time to work on this, after all. I’m convinced, so the project is renamed: Grid Pie. Translated to french: Grid Tarte, twice removed. I will be working on this idea during Music Hackday Montreal. I will spend 24 hours on it. Hint: those tracks above would result in a pattern with 1040 lines…IOW, not an optimal fit. -- the following will output "1040"
Grid pie has arrived, Check the first post. I loaded the beat slicing tutorial to test Grid Pie but it crashes with that song. maybe because there are to few tracks? Can you send me the steps to reproduce, or some log? I can’t reproduce it anymore so it seems fine. 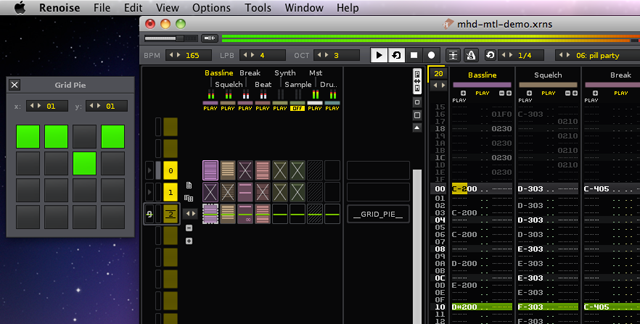 It was as simple as: open renoise>drag grid pie onto it>load beat slice tutorial song>execute grid pie. great tool btw, lot’s of potential. Error Message: 'C:\Users\Paul\AppData\Roaming\Renoise\V2.7.2\Scripts\Tools\com.renoise.GridPie.xrnx\' failed to execute in one of its menu entry functions. OK, I figured out the bug. File in first post (v0.2). thanks for this one its great idea! just the 4x4 is very small 8x8 and playable with launchpad would be great i think it would be also helpful to jump 4 positions (or 8 in an 8x8 matrix)on the x and y axis - this really have potential!! But that’s just my 2 noob cents. I’ve had problems making dynamic grids in the past. Too many Lua errors last time I tried. I’m sure it’s possible, somehow, but I won’t be the one to do it. Patches welcome. But like you said, it’s possible now by looking at the Lua. Inspire yourself with the code snippet from: this example. I won’t have time to mess around with this script for a couple of weeks. But that doesn’t mean you guys/girls can’t have a go at it. Post your hacks? Grid Pie 0.3 available as attachement in first post.